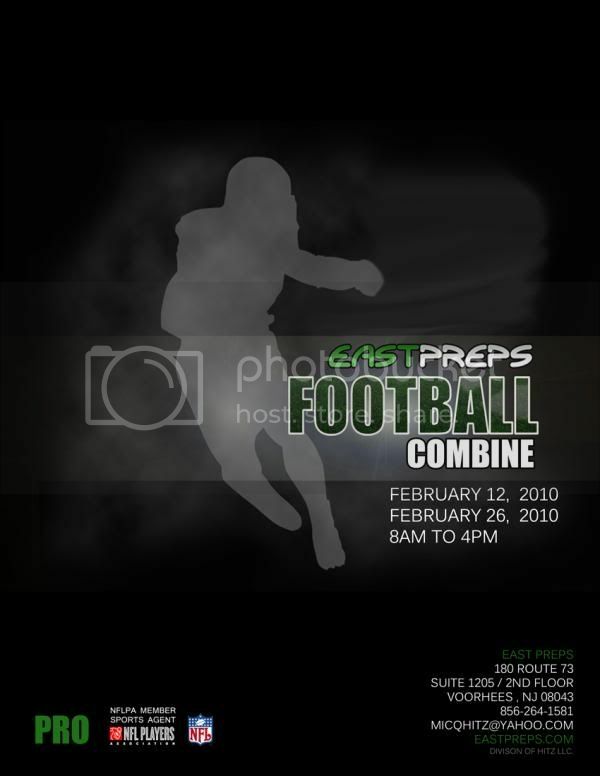 EastPreps Pro Football Combine will take place February 26th, 2010 in Cherry Hill, NJ. We invite several NFL agents and scouts to attend and view the players. EastPreps is sponsored by Hitz Sports Management who will select up to 25 players to manage and represent to place in the NFL, CFL, AFL, UFL, and CDFL. Players who attend are required to register and pay the $190 administrative fee which will include an EastPreps combine DVD fo your performance as well as a combine profile on eastpreps.com that will be sent to over 200 pro contacts including all NFL, AFL + player personnel. Also included is an eastpreps pro plaque, t-shirt and written evaluation of player performance. Every player that attends the camp will be given a fair opportunity to be looked at by an NFL agent. $190 is a bit steep tooz when they are the ones that will be representing you! They will be promoting you though with the dvd of your strenghts and all. I just know that they will be getting their 3%-10% Agent Fee if you do end up signing any dotted line!!! I heard of them before they are looking for some quality athletes to represent! I talk to one of there represtatives, through a friend, but I have another question! Will they be providing training for an players that in their minds are worth it???? I understand you put out what you think you will receive back, but for less than $190 you can get someone to film you do NFL Pro Combine testing! Maybe it's pretty legit if it comes from an agent though!!!! I wonder if they are going to send their players to the combine off of combines.com or are they going to send players to the ufl combines down in florida along with being represented????? I do know that they have a player in the league now, but I think that maybe that is it. I can clear up a few of the concerns. The fee may seem steep at face value but not when you consider the opportunity that is available. Sure, you can get somebody to film you doing combine testing for less money but at the end of the day how far can that get you unless it gets in the hands of the right people. We have contacts in every professional league, as well as there will be a number of those scouts in attendance. In addition, we are going to have professional trainers, Allen "AJ" Davis of Team Hopkins and Gregory "Graig" White of Team Conditioning Systems assist with the drills teaching techniques and methods to improve performance. The truth of the matter is not everyone that attends will be signed however you will be given an opportunity to be seen by professionals in the business as well as work with trainers that will help improve your technique and identify weaknesses which will be extremely beneficial. On top of that, you will receive a DVD of your performance and a written evaluation. ALL THOSE COMBINES ARE GARBAGE!!!!!!!!!!!!!!!!!!!!!!!!! If you have to pay to attend the combine, it's not really a combine! If you have the talent, get yourself and agent and get a workout with a Pro team. All the other stuff is just to make money!!!!!!!!!! *OUTLAW* wrote: ALL THOSE COMBINES ARE GARBAGE!!!!!!!!!!!!!!!!!!!!!!!! !